The Achaemenid dynastic structure known as the Ka’aba of Zoroaster is on the verge of collapse due to escalating earth sinkage at the ancient site of Naqsh-e Rostam in Fars Province. The measured earth sinkage previously reported by experts was five centimetres, but a new survey shows that this amount has increased over the past few days, the Persian service of the Mehr News Agency reported on Monday. Experts believe that the occurrence may lead to the destruction of 2500 year-old edifice, which is located at a distance of five meters from the sinking earth. This also could cause cracks in rocks bearing the ancient bas-reliefs, they surmised. Drilling numerous wells by the Islamic Republic and consequent reduction in the level of water tables in the region is the main factor causing the catastrophe. “The earth sinkage may result in a landslide or a rift that could destroy the ancients sites located in the region,” said geologist Hassan Mousavi. Mousavi believes the unduly draining water from the numerous wells dug close to the site is the main reason for this. In order to prevent a cultural heritage catastrophe in the region, he suggested that further exploitation of the wells must be stopped until water table levels are restored. However, number of experts believe the cause of the sinkage is also related to the recently constructed railways road by the Islamic Republic. The Railways is connecting Isfahan to Shiraz is only 1000 meters away from the ancient site and the trains vibrations can easily be felt in Naqsh-e Rostam. In 2006 experts and cultural institutions including CAIS warned the vibration generate from the passing trains will cause the collapse of the Ka’aba of Zoroaster, and asked the project to be scrapped or transferred to another location away from the ancient sites. However, like many other development projects in Islamic Iran, the objective is not to develop but to destroy, Islamic Republic went ahead and constructed the railway near the site. 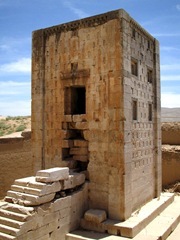 The regimes plot was apparent – to ensure the destruction of the K’aba of Zoroaster and other monuments in Naqsh-e Rostam. Since taking over the power in Iran, the Islamic republic has begun their cultural-cleansing of the pre-Islamic Iranian heritage under the guise of the development projects. The totalitarian-theocratic regime since then has damaged and destroyed large number of major pre-Islamic cultural landmarks. Islamic Republic is considered to be one of the most destructive, brutal and corrupt regimes has ever ruled over Iran. Their reign of tyranny and terror surpasses the Alexander, Arabs, and Mongols invasion of Iran – and their incompetence to govern and run the country is compared to the Qajars and loss of 17 Iranians provinces in Central Asia and Caucuses, as well as Afghanistan. The regime runs by mixture of opportunist-corrupts who gathered wealth beyond imagination at the expense of the Iranian nation — or backward-dogmatic Islamic-fundamentalists who hallucinating and seeing ‘halo’ or ‘Shi’a saints’ standing beside them and believe by spreading the rule of terror, hatred, tyranny and pain on earth, they would speed up the return of twelfth Shi’a Imam called Mahdi to earth, in their case ascending from a water well in Jamkaran near Tehran. Located in Iranian Fars province, 12 kilometres from Persepolis, Naqsh-e Rostam contains four tombs belonging to Achaemenid kings which were carved out of the rock. The site also contains remnants of the Elamite, Parthian and Sasanian dynastic eras. The Ka’aba of Zoroaster along with the Naqsh-e Rostam region is one of the most unique and important sites in Iran-proper. There are various theories on the original purpose of the monument. Some experts believe that the monument was the home of a complete copy of the Avesta which had been written on 12,000 leather parchments which was burned by Alexander II, the Macedonian warlord in 4th century BCE, it has been suggested that it was a place where the Zoroastrians’ sacred fire was perpetually burning. Others claim that the site was used as an ancient government archive. 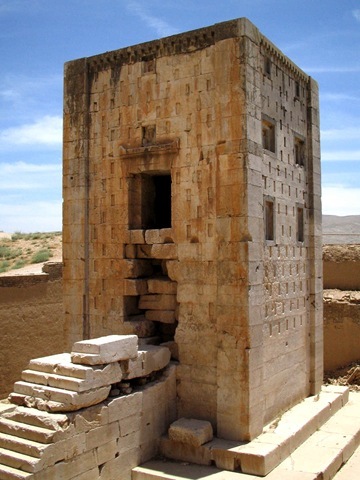 In 2005, Iranian researcher Reza Moradi Ghiasabadi proposed the structure was a unique calendrical calculations and astronomical building during the Achaemenid dynasty (550-33- BCE). The structure bears a Sasanian dynastic era inscription explaining the historical events that took place during the reign of the Emperor Shapur I (241-272 CE). The trilingual inscription, written in the Sasanian and Parthian Pahlavi as well as Greek, describes the victory of Emperor Shapur over the Roman Emperor Valerian in 260 CE. Islamic Republic ranks 88 out of 158 countries on the "Transparency International’s Corruption Perception Index" (CPI) with a CPI score of 2.9 (a scale of 0 – 10 with 0 being the most corrupt). CNN is recently published a report exposing 60 member of the Islamic Republic who have stolen billions of Iranian’s assets and hidden overseas. I really hope that the Kaba of Zoroaster & other pre Islamic structures are preserved. Is there anything we can do to raise awareness amongst the Iranians so that the government is pressurized to secure Iran’s heritage ? THOUGH I AM NOT A PARSI BY BORN BUT I BELIEVE IN AND RESPECT EVERY RELIGION AND I WISH AND REQUEST ALL PARSIS WHO KNOW ABOUT THIS SITE MAY REQUEST ALL PARSI BROTHER AND SISTERS TO VISIT THIS SITE AND COME CLOSE AND EXPRESS THEIR VIEWS, SO MANY WILL BENIFIT FROM OTHERS KNOWLEDGE. EVERY GOOD OLD THINGS[CULTURAL HERITAGE] WITH WHICH OUR EMOTION AND SENTIMENTS ARE ATTACHED MUST BE PRESERVE. In India in the 1800s, once again saw Zoroastrian texts being belittled by several missoneries..Zoroastrian rituals once again were set to be destabilised away from Zoroastrianism under one pretexts or the other..ironically the dakhme system was then also ridiculed and the gullible few zoros fell into the trap and some acted as puppets, but we survived as Zoroastrians..
Last 2 decades ago once again the stage was set, the yasnas became unzoroastrian, Zoroastrian texts became unzoroasrians, Zoroastrian foundations were attacked..and some of the people behind them became self professed ‘Ratus’..with a strong puppet and misinformation system. i am more worried about all zoros whose number is decreasing day by day. i am not a zoro yet have a deep respect and great love for this wisdom-studded religion n its peace-loving followers. in this reign of quantity,may i be permitted to beseech all zoros: for love and sake of AhuraMazda increase your numbers not to dominate any faith but at least to keep the primordial Truth alive and Fire of enlightened realities burrning in the human race. I am a Pakistani Muslim and a qualified Banker by profession. I am somewhat practical Muslim and always feel ashmed because I must be a true Muslim. Being a Muslim I have respect for Holy Places of the followers of all the religions. Opinions may differ in this issue but so far as mine is concerned Islam categorically teaches its followers to pay due respect to other religions. It is our duty to call them to our religion but if one doesn’t want he or she has its own faith and the fate. I think that in Iran there is a religious government and it will take care of the Holy Places of Parsees. The only issue is to make the said government aware of that. Fo that purpose I will suggest to start a campaign. Do you people agree? That is a nice thought Abrar. Rustom, soon after WAPIZ won BPP elections, they went on record boosting of their number and their strong support base within the community. You yourself have been saying the majority of Zoroastrian Parsis are with the orthodox, than why do you have to whine on every blog about a fringe minority of reformists in the community? Tell me how is this small insignificant group of reformists responsible for the way community is going down the drains?… and how is all this hatred that you spew against them is even remotely connected to K’aba of Zoroaster that is in danger of collapsing? Infact Since we are in small numbers, a lot matters whenh disimformation or misinformation tends to delink Zoroastrianism from itself..
2) Ask people to look the other way when neighbours are robbed as the happening of a robbery was a minor event in the happening of all events in that nite..
3) Ask the world to ignore the Jewish Plight as they are a small nation with limited rato wise population..
4) Ask the world to ignore Haiti as its only in one place that the earthquake happened..
7) U can promote tha Ahmedjans statement that Israel shud be banishd and that there was no holocaust at all, since such statements imply a lot though having a limited voice..
You can now preach that Zoroastrians being small sud convert to the prctises of the Byzantines or Islam as we shudnt look at small numbers .. Thus ure wisdom is highlighted when u portray that we shudnt be bothered when a small number ( or big doesnt matter–Zoroastriansim is not something that can be changed on vote bank basis just like einsteins law, or archimedes principle canot be changed by a vote or majority/minority)..
a campaign to save Zoroastrian structures in Iran is a good idea. But how does one go about it ? Rustom, tusi great ho… you compare few hundred reformist in Zoroastrian fold who either support navjote ceremony of children from mix marriages or would like alternative means of disposing their dead, to Hitler [? ], Nazism, WW2, Talibans, robbers, rapists[? ], criminals[?]!! Wow!! ROFLMAO!! Ahsan, im quite sure, the shitte islamic government knows Dimmi laws as stated in Shari’ah better than all of us here. I think it says, the Islamic state pledges security of dimmi’s property including places of worship…but it also obligates dhimmis NOT to “restore” any [places of worship] that have fallen into ruin. Again as per some Islamic scholars, dhimmis could not use their places of worship if their land was conquered by attack. In such lands, as well as in towns founded after the conquest, or where inhabitants voluntarily converted wholesale to Islam, Islamic law does not allow dhimmis to build new churches, synagogues, fire temples or expand or repair existing ones, even if they fall into ruin. Therefore i guess, Islamic Government in Iran is following the right path as quoted in Shari’ah laws. Whether its a right path taken on on ethical grounds is a different matter. In my opinion, such old heritage buildings are invaluable wealth inherited by a nation, and they should feel proud and honored to have such a glorious past. Instead most Islam countries have always worked towards wiping out past historial sites and show scant respect towards pre islamic civilizations. We need to involve some international organisations that work with heritage and conservation. Something on the lines of UNESCO. This should be on the world Heritage List. Dont waste your time. If such ‘historian’ has conviction let,WAPIZ send him to Iran to argue the case with Mullahs who too are as dogmatic as this ‘historian’. when shown with examples of how ignoring minority or how even a small wrong propoganda has effects or the ill effects of ignoring the minority’s ill aims, you go off to an tangent ..
Piloo atleast i try and safeguard instead of belittling..
Infact if your cotirie had the gall in them to exercise their right to follow whatever they percieve right without blackmailing,dividing, belittling, misinformation,lieing, jumping from excuse to excuse and lastly tear jerking trying to gain sympathy after deriving conclusions that Parsis betrayd India or that Likes of Dr Kotal who got his recognistion abroad in the 1960..due to WAPIZ!!! (Im sure either even u must be laughing or cringing at this fancifull imagination and passing judgements by the likes of you)…we would be able to chanelise our energies to preserve our heritage elsewhere..
Hey Piloo, Religious but Rational( so rational he also thinks archeological evidence is no evidence)….you shud sue the writers of this article..after all you had claimed that Persians didnt have tools !! to dig..and thus we had dakhmas…?? Remember you and ure cotorie(Dhongi, Piloo etc etc) had even laughed at the example of the famous Persian system to store cold water and refrigeration..
Ofcourse saf can join the tearjerking now…and hey im not belittling anyone..onl citing examples of how your group belittles everything not liekd by it or even stoops down to claim archelogical evidence as debris! !just to quench ure demand on everyone to change forever..to meet ure likes! The claim to be SAFEGUARDING something by posting incessant messages on a portal is absurd, to say the least. The repetition of same words like ‘tear jerking’ coteries ‘blackmailing’ are now monotonously overused. As for refrigerator, which brand do you use Jamaji?
. Yes Saf, it is kaklat on each and every subject on this portal from an individual who expects everybody to agree with him or else get branded as anti Zoroastrian. I happen to be an admirer of your community and nothing more. What makes me wonder is how critcizing each other can help solve the problem of saving the Kaba. Jamaji, what exactly is your contribution in tangible terms to save the Kaba? What efforts you and others have put in or desire to put. If pulling down each other is a solution according to you, then you are just an arm chair critic. Do something constructive and show the same to your fellow men with whom you have differences that you are capable of achieving something. That will silence your critics for ever else they will constantly remind you of absence of tangible results. Rustom, If you were any serious about being a ‘Saviour of Zoroastrianism’, as you claim… than you would be doing something about saving the K’aba of Zoroaster rather than wasting your time typing useless comments on blogs. “we would be able to chanelise our energies to preserve our heritage elsewhere..
Makes any sense? Is he trying to say, he would have saved the above structure in ruins if only small group of Parsis would have not asked for an alternative means to dispose their death!! !…Just goes to show what a bunch of spineless loosers these so called Saviours really are !!! Piloo, like i said earlier…this building on the verge of collapse is an ideal example to show what happens to a 3,000 year old structure if its not repaired and restored on time… very similar to what would happen to a 3,000 year old religion that shuts its door on reforms. I have given up SAF, debating a vacuous blabber does injustice to our own intelligence. Strongly suggest you too avoid arguing with such elements. As said by some one, these self styled Scholars can not break even a pappad.They will dole out excuses after excuses to shirk taking any concrete steps but indulge in blame game for their incomptence.